Veteran US broadcaster Larry King has presented the final edition of his long-running CNN talk show after 25 years with the cable news channel. The 77-year-old fought back tears as he told his audience: "Thank you, and instead of Goodbye, how about So Long?" President Barack Obama paid tribute to the star in a taped message, in which he said his show had "opened our eyes to the world beyond our living rooms". 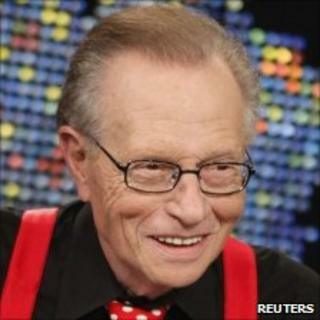 Larry King Live has ended after more than 6,000 shows and 50,000 interviews. Former tabloid editor and talent show judge Piers Morgan will take over his coveted time slot in January. Thursday's edition saw former president Bill Clinton make his 29th appearance on the show via satellite from Arkansas, while crooner Tony Bennett sang The Best is Yet to Come. California Governor Arnold Schwarzenegger appeared to announce he had made 16 December "Larry King Day" in his state as US TV stars Ryan Seacrest and Bill Maher joined King in his New York studio. "This is not Larry's funeral. He's hopefully going to be in our living rooms for a lot of years to come," said comedian Maher. "This is the end of a show, not the end of a man." "You're not going to see me go away, but you're not going to see me on this set any more," King said. The broadcaster has promised to "still be a part of the CNN family", saying he planned to host special one-off programmes.